Built-in wireless Bluetooth 2.0 keyboard. Modern style designed for iPad. Built-in rechargeable lithium battery lasts for approximately 55 hours per charge. Special HOME screen key for one touch access to variety of application. Light weight, quiet keystrokes, water-proof and dust-proof. 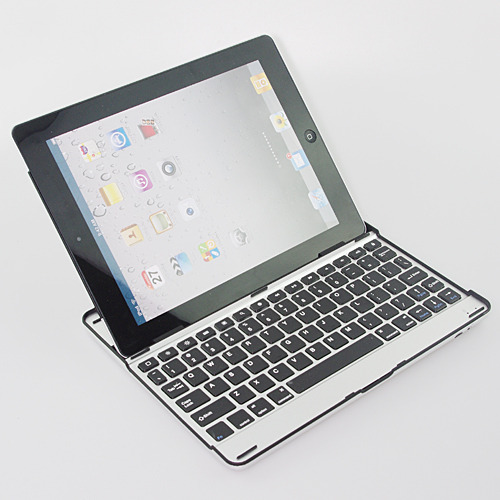 The wireless Bluetooth keyboard can be connected to iphone 3G, 3GS, 4G and ipod Touch that had installed iOS 4.0/5.0 or higher. For other Bluetooth enabled device, please verify the Bluetooth standard & compatibility before attempting to connect to the keyboard. 1. Turn on the power toggle switch. The [Power] and [Bluetooth] indicator light will be 5 seconds, then, the light will go off. 2. Press on the [Connect] button. The [Bluetooth] indicator light will be blinking, and the [Power] indicator will be on. The keyboard is now ready to be connected to iPad. 3. Turn on and unlock iPad. Click on the iPad [Setting] icon. 4. On the [Setting] menu, select [General] to access [Bluetooth] settings. Click on [Bluetooth] to turn on the connection. iPad will automatically search for a Bluetooth-enabled device. 5. Wireless keyboard found. Click on the device to connect. 6. Enter the password code as displayed on screen. 7. Wireless keyboard connected successfully. [Power] indicator light will stay on until the keyboard is switched off.